The quest to rescue princess Sita is coming to an end as Rama and his army of monkeys make their final push for victory against the demon king Ravana of Lanka. In the ensuing battle, Rama defeats and disarms Ravana but magnanimously spares his life. That night, Ravana unleashes his most powerful ally; his brother Mahiravana, a dark and powerful sorcerer who rules over the Underworld. Mahiravana's shadow casts a blanket of deception over Rama's army and the unseen enemy captures Rama and Lakshmana. Mahiravana intends to kill the two princes at daybreak to fulfill a prophecy that will make him invincible. 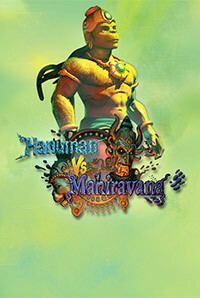 Can Rama's friend Hanuman save them before it is too late?